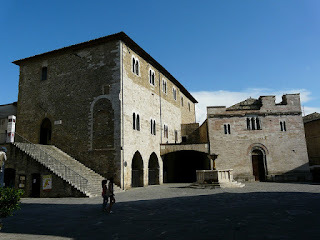 In the sleepy town of Bevanga in the region of Umbria time runs slower. The well-preserved medieval walls seem to shield the town from the hustle and bustle of the 21st century outside their perimeter. Originally Etruscan, Bevagna became part of the Roman Empire in 80-90 BC and served as an important stop on Via Flaminia, one of the main roads to the Eternal City. Ruins remaining from the glorious days of the ancient Romans can be found throughout the town: a Roman Temple, Theatre, which could hold up to 10,000 spectators and the Baths with beautiful black and white floor mosaics dating back to the 2nd century AC and depicting sea monsters, a lobster and octopus. While walking in the historic centre of Bevagna you can admire stunning views over the lush countryside outside the medieval walls. The central medieval square, Piazza Silvestri, has changed little over centuries. The 13th century Palazzo dei Consoli, decorated with slabs of travertine stone and beautiful mullioned windows was transformed into a small theatre in the 19th century. Check out the two lovely Romanesque 12th century churches facing each other: San Michele Arcangelo and San Silvestro. The Monastery of Santa Margherita has spectacular 16th century frescoes and Scala Santa, which, just like the one in Rome, many pilgrims climb on their knees to obtain a plenary indulgence. 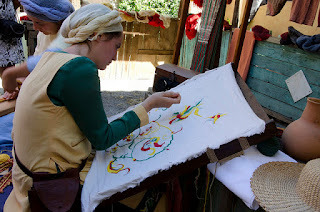 If you visit Bevagna in the last ten days of June you will be able to see the Mercato delle Gaite, a historic Medieval life re-enactment when residents wear period costumes and local artisans demonstrate ancient crafts. Do not miss a chance to taste delicious local dishes such as a snail stew with tomatoes and herbs (lumache in umido), gnocchi with local wine Sagrantino, crostini with chicken liver and spleen and hard tozzetti cookies dipped in Vin Santo wine. In the sleepy town of Bevanga, only two hours driving from Rome, in the region of Umbria time runs slower. The well-preserved medieval walls seem to shield the town from the hustle and bustle of the 21st century outside their perimeter. Originally Etruscan, Bevagna became part of the Roman Empire in 80-90 BC and served as an important stop on Via Flaminia, one of the main roads to the Eternal City.